As a confessed weight weenie, I generally try to find the weight of components before impulsively buying it. There are a couple reasons for this: first it helps slow down the process (i.e. fewer things that I need to explain to my partner later), and second if I’m going to add weight to the bike I want it to be a conscious, measured decision. 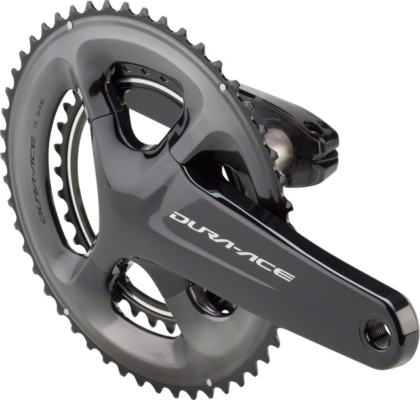 So it was quite frustrating that I wasn’t able to find the weight of the the Shimano Dura-Ace R9100 175mm 50/34 crankset. Apparently, all the other weight focused cyclists out there opt for the less aerodynamic, but obviously slightly lighter, 172.5mm cranks. Or, perhaps, my searchfu is just lacking. Anyone good with the math (or can use a calculator) will notice that 4+444+173 = 621, not 622. So clearly, there’s some loss of detail in the .x position because my scale doesn’t measure at that level. Should probably get a better scale. For reference, the Ultegra R8000 version of this crank comes in at 691g.